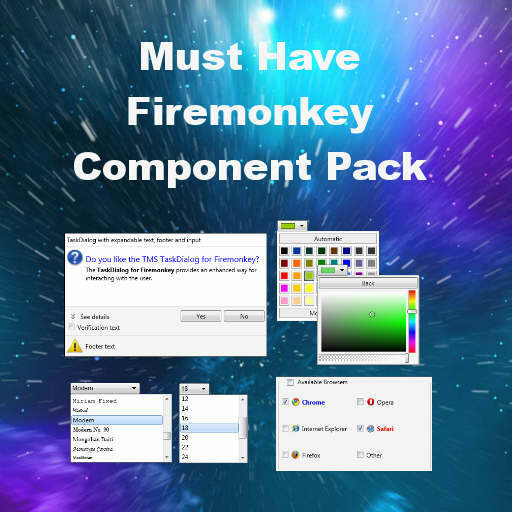 TMS Software has released their TMS Pack components for Delphi XE7 Firemonkey, This new release contains five new components which are TTMSFMXTaskDialog, TTMSFMXCheckGroup, TTMSFMXRadioGroup, TTMSFMXFontNamePicker, and TTMSFMXFontSizePicker. This brings the total number of components in this Firemonkey super pack to ~50 (I think as we’ve covered it before for XE6). If you only buy one component set for Firemonkey I think this one is a must have. Two components that it has which are really useful are TTMSFMXWebBrowser and TTMSFMXTableView. The TTMSFMXWebBrowser control is a cross platform web browser component which means it uses ChromiumFMX on Windows, WebKit on OSX, plus the native WebView controls on Android and IOS (which I think are also WebKit based). Wha’s great about it is you can have just one web browser control and you don’t have to mess with conditional compilation.The TTMSFMXTableView component is basically an expanded TListView component but it has buffered display of items which is suppose to speed up performance. Apparently the normal TListView component doesn’t do the trick where it really only has a few items and it just changes the values in the items when you scroll verses having a scroll box and hundreds of scrollable items. I use both TListView and TTMSFMXTableView in our enterprise app with TTMSFMXTableView being used in places where I think there will be a lot of items displayed. In any event that is only two components out of 50 in this amazing component pack. Other components include gauges, LEDs, badges, sliders, popups, dials, spinners, color pickers, buttons, grids, trackbars, and many more. All of the component work on all Firemonkey platforms which are Android, IOS, OSX, Windows, and they probably even compile in Appmethod as well. This is a commercial component set but there is a free trial available. Additionally, you can get it bundled with more components (the TMS Component Studio). Head over and check out the full features of the TMS Pack for Delphi XE7 Firemonkey.